MUS’s Nick DiMento (L) vs Devin Geiger (R) before the St Michael’s Cup 2014! COMING UP! The 2015 St. Michael’s Cup - Jan 30, 2015 at CBHS! The Christian Brothers High School Fencing Team has been in existence since 2005. 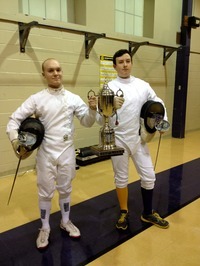 It is Memphis' most successful high school competitive fencing program. Started by Dr. Durant Fleming (then the Religion class teacher, now Assistant Principal of CBHS!) and Coach Tom Knowles, the team started with over 15 students who wanted to fence. Since then it has achieved many goals, including being #1 in the State of Tennessee for High School Fencing several times and winner of the prestigious MUS-CBHS rivalry - the St Michael's Cup - seven out of nine times! Please peruse the CBHS Fencing Archives for images of past glory and the current page for the latest on Brothers with Swords!